Today, real estate agents are increasingly looking to Facebook as a content distribution and engagement channel. Luckily, with a little creativity, Facebook could be your next great source for obtaining high-quality leads. Your leads or also known as “lead generation” on Facebook are the people which have shown interest in your offering by sharing, liking, commenting etc. on your Facebook content. Leads are important because they would probably much easily convert into your next client. Yet, converting high-quality leads into closed clients is the end goal of every real estate agent. If used wisely, this platform can represent a great source and lead generator. In 2017, Facebook remains as number one social media platform in the Social Media world with 1.04 billion active users per day. The whole point here is that there are people that are actually active on Facebook and use it every day to interact with each other and search for products, services, and information. Audience reach is what makes Facebook be attractive in the process of acquisition of new leads and future clients. And that’s what is great here; you can actually sell and present great opportunities to an interested audience, in your case your future clients- investors. Real estate agents must understand the difference between a personal Facebook profile and Facebook page. By having a Facebook profile you do establish a personal approach whereas, a Facebook page represents a professional business approach to the Facebook community. 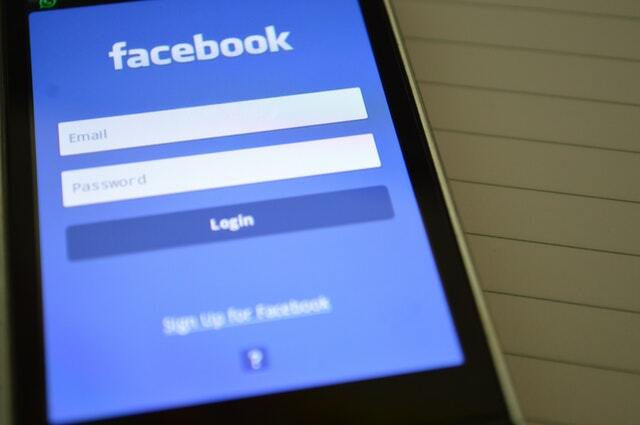 Your Facebook page must include all relevant information and appropriate links to your website. As a profile photo put your logo or a professional photo if you don’t have one. The cover photo can showcase one of your attractive opportunities. Before setting up your Facebook page, create a Facebook strategy, whereas you will plan your content on a weekly basis. For sure, avoidance of monthly budget for Facebook Advertising is a must. 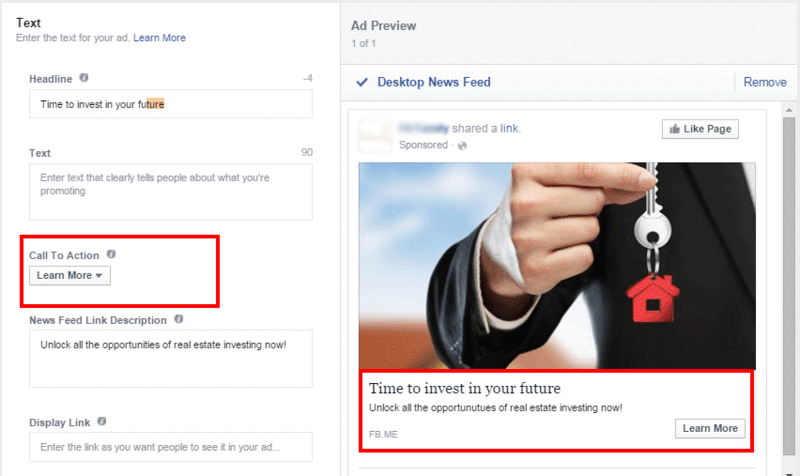 Facebook’s Ads platform, the place where you place your ads, offers plenty of opportunities for real estate agents. Definitely, no matter you are in the real estate investing industry, you shall not forget that Facebook is a marketing tool as any other you use to obtain new clients. So, be wise, and behave as a professional inbound marketer. That means, plan some time to read the latest social media trends and try to incorporate them into your Facebook strategy. However, your presence on Facebook, will not secure your lead generation even you set a Facebook and spend some budget in advertising. More elements create the best value of being social. By keeping your Facebook Page posted on a daily basis or at least by five posts per week, you show a consistency of your social media presence. That’s how you will give a great first impression to your new audience and your existing one. As we already know, your Facebook Page is a great channel for two-way communication with your fan base. So, use that, and share different news and information from the real estate investing industry and gain the perception as an expert in your field. Thinking about what it may be you could share and talk about on Facebook? So, after liking and visiting your Facebook page, your future clients will have a more focused and narrowed view of all your activities. 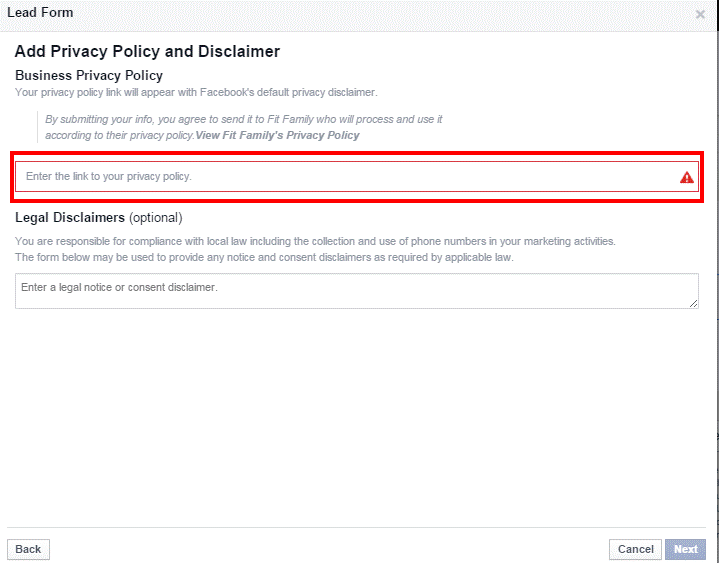 Important Tip: Facebook has changed its rules for post visibility. In many cases, you need to take in mind that the best way to increase the ‘post engagement’ and visibility of your postings is to use the Facebook Advertising. But, there are many different ways of creating Facebook campaigns for creating clients, so carry on and read this article to the end. Every objective is attractive and which one we are going to choose, depends on the campaign we are going to place. For example, you can use the option ‘boost your posts’ for getting more exposure to special opportunities, blog articles, your business news etc. The second option, ‘Promote your Page’ is a good idea if you want to achieve more people to like your page and enlarge the fan base. The third and the fourth option ‘Send people to your website’ and ‘Increase conversions to your website’ are actually great objectives if you want to gain more website traffic and generate direct and indirect leads, a.k.a potential clients. The next two options are the best deal if you already have created a mobile application. 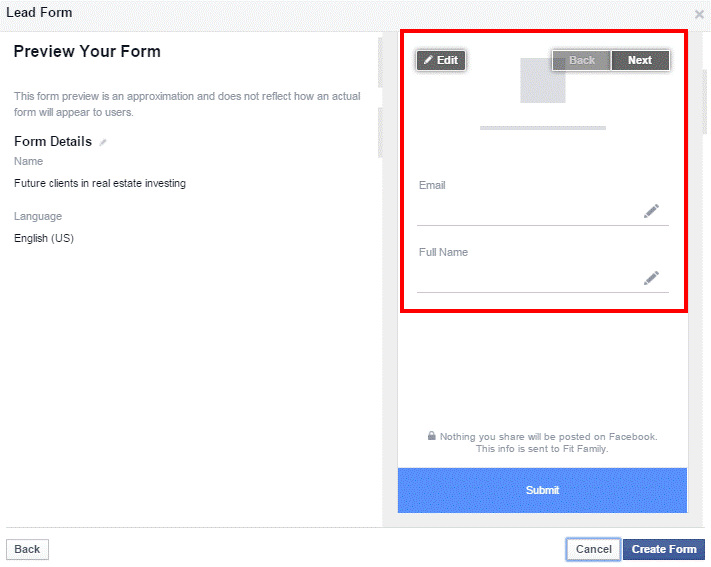 If you use to create Facebook events, then ‘Raise attendance at your event’ is a great choice to raise the attendees or the people then will click ‘Going’ or ‘Interested’. Get video views is most suitable when you post videos on your Facebook page. Latest announced objective in 2017, ‘Collect leads for your business’ is a great valuable deal to collect leads on Facebook that are actually interested in real estate investment. So, how can we assume which one to choose and obtain high-quality leads? At a first side, you might think “Post Engagement” is the best match. But we are sure you don’t want to have people that accidentally clicked, liked or just commented on a post they have found it interesting at the moment of scrolling their Facebook news feed. What you need is high-quality leads that will most probably do the second step, do the desired conversion. That’s why obtaining direct leads with Facebook has been seen as a great deal for many real estate agents. Direct leads are collected with Facebook campaigns which refer the Facebook users to special landing pages whereas they ‘land’ after they clicked on the Facebook ad by showing an interest in the product, service or information. Those ads may present sponsored links to free ebooks, webinars, articles with advice and useful tips, new opportunities etc. and the goal is to send the Facebook user to your web page, which is optimized to take its contact details. This method could be a bit risky because the Facebook users may lose their interest after they see that they are referred to a web page out of Facebook. In many cases also the internet and the slow loading of the landing page might cause bad experience – the Facebook user clicked the ad but the server didn’t load the page (the worst scenario especially if your Facebook campaign is optimized for pay per click). As of this year, Facebook announced “Lead Generation” Ads, that directly collect the leads through Facebook, excluding the need to send the Facebook user to an optimized landing page. 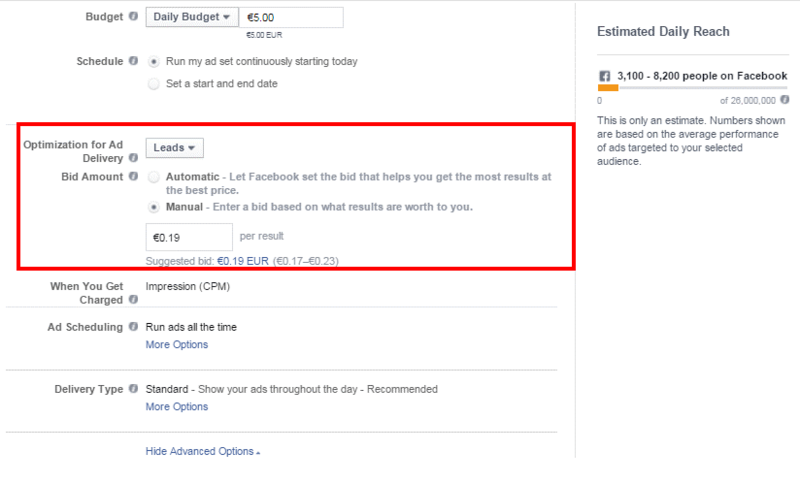 Lead Ads can be created through the Facebook Ads Manager and Power Editor. 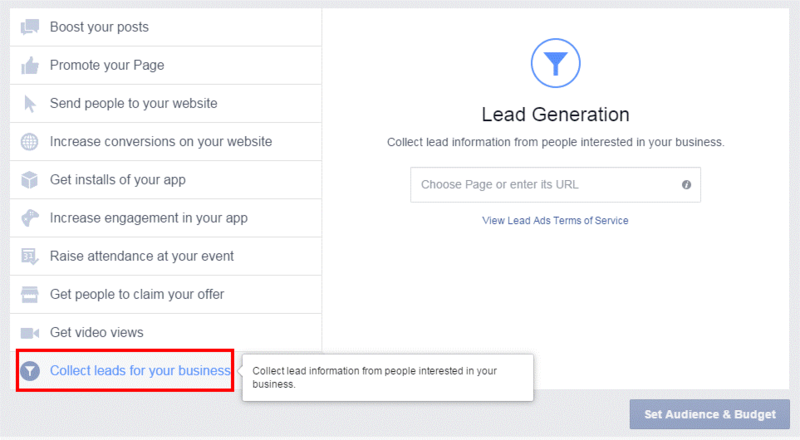 After you have chosen the “Collect leads for your business” objective in Facebook Ads Manager, you are referred to the second stage. You give exact information for the leads you would like to obtain by choosing your demography, age, interests. With the option ‘detailed targeting’ you can further narrow the audience according to their interests. While setting up leads ads in the field ‘bid amount’ you can bid with Automatic or Manual Bid. 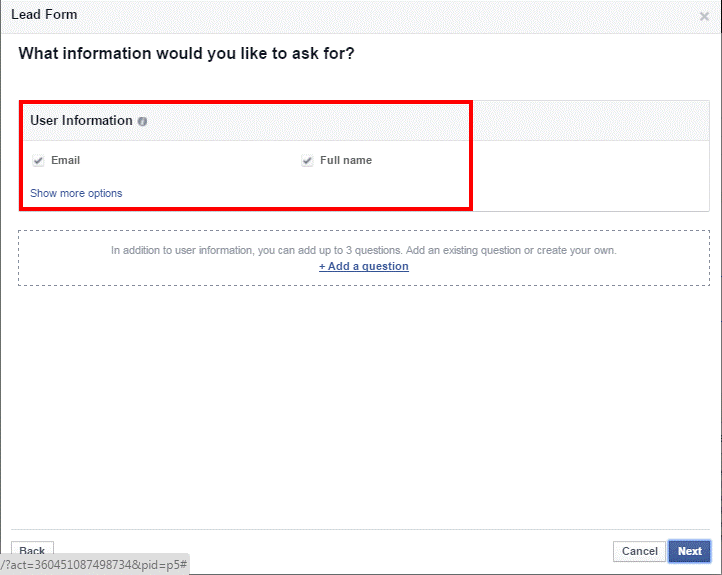 If you choose ‘Manual’ you can choose the exact value which you are ready to pay, per Facebook lead. This is super cool! Lead ads are designed to include a space for attractive text in the fields ‘Headline’, ‘Text’ and ‘News feed Link Description. Furthermore, different call to action is available for your lead ad. You can also add “Legal Disclaimers” but this is optional. 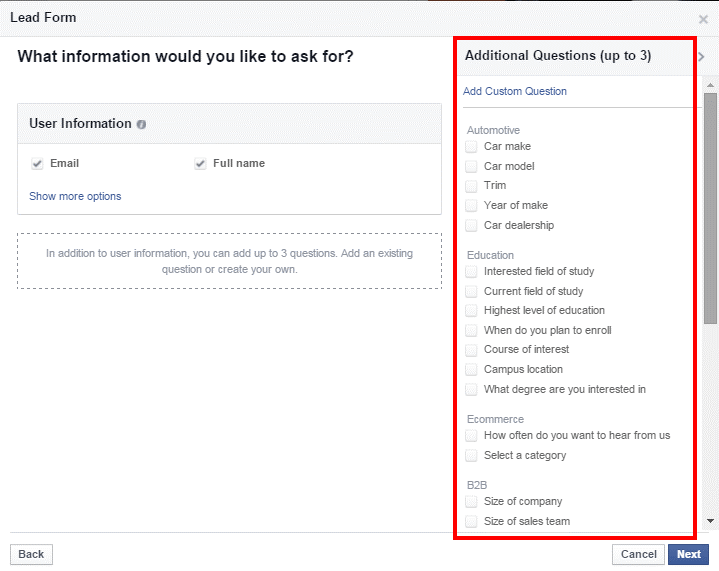 Next, Facebook will ask you for the data to be collected from your leads. Max three additional questions by your choose. Maximum 3 additional questions can be added to the form. The questions are split into different categories. And you are DONE. Your form is ready to collect your next potential clients a.k.a leads. Presence on Facebook and Facebook Advertising is a valuable deal for real estate agents and cannot be missed off in 2017. Lead generation for real estate agents is a key prerequisite for success on the social media. For a couple of dollars a day, with the new option for “Lead Generation” a real estate agent who understands inbound marketing can bring in dozens and dozens of quality, targeted leads that they can then strategically nurture and convert into closed clients. Embrace the idea of Facebook as a rich network that allows you to connect with prospects and customers – in other words, a place of actual people that use Facebook on a daily basis. No matter the result of your Facebook advertising, you can always present yourself more professionally on Facebook with a Facebook page, for free. 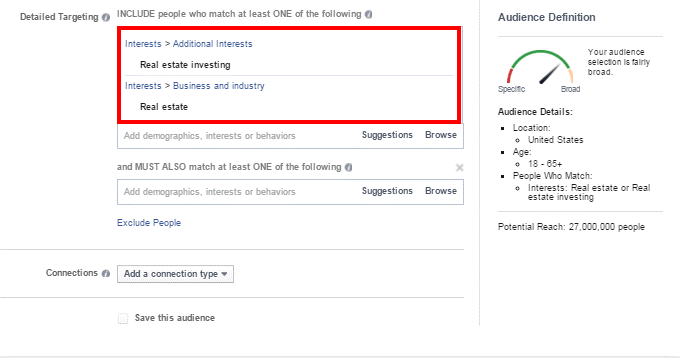 And Yes, Facebook can be used in the real estate investing industry with a super tight budget in comparison with traditional Advertising and compared to other advertising channels from the marketing mix. Be wise, and use it!